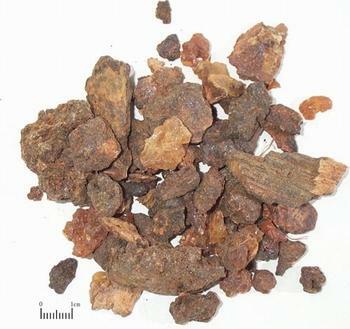 The exudation of factice resin from skin areas of bush or tree Commiphora myrrha Engl. of family Bruseraceae and plants of the same family. Collected from November to next February. Densely fragrant, bitter and light pungent taste. Big, brown red, translucent, slightly sticky, dense and long-term fragrance, purified. Pungent, bitter, neutral, heart, liver and spleen meridians entered. Activate blood and alleviate pain, resolve swelling and promote tissue regeneration. The actions and indications are similar to those of Ru Xiang. It is reinforced by the combination with Ru Xiang for traumatic injuries, pain due to stagnation and stasis, abscess, deep rooted carbuncle, swelling and pain, ulcerated sore and abscess not healed for a long time and all the pain due to stagnation and stasis. As same as Ru Xiang.